Last week, Hillary CLinton and her competitors for the 2016 Democratic nomination* each met privately with the top leaders of the nation’s unions in individual attempts to woo the AFL-CIO executives into granting the labor federation’s much-coveted AFL-CIO endorsement. While, at this point, HIllary Clinton’s main rival for the sought-after endorsement is the socialist Senator from Vermont, Bernie Sanders, Clinton did not hesitate in dangling a carrot in front of the AFL-CIO Executive Council’s nose. 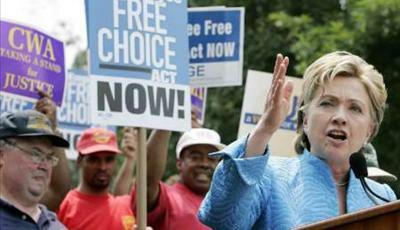 Democratic presidential contender Hillary Clinton supports comprehensive labor law reform. And she says she really means it. 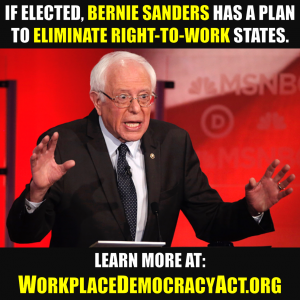 The former New York senator and Secretary of State under President Obama told the AFL-CIO Executive Council on July 30 that “I believe worker power is vital to increasing incomes,” in words she repeated at a subsequent press conference. “I was an original co-sponsor of the Employee Free Choice Act while I was in the Senate and will do everything I can to pass it” if elected to the Oval Office, she declared. In addition to card check, EFCA also called for the use of government-appointed arbitrators to determine employers’ wages and benefits, binding employees and companies into contracts as quickly as 120 days after unionization. Prior to its defeat, employers were understandably vehemently opposed to the erroneously-named Employee Free Choice Act (EFCA). However, just as importantly, for employees, EFCA would have effectively removed employees’ right to vote on 1) wether or not to become unionized, 2) vote on a contract, and 3) to strike if they were unsatisfied with whatever a government arbitrator imposed. 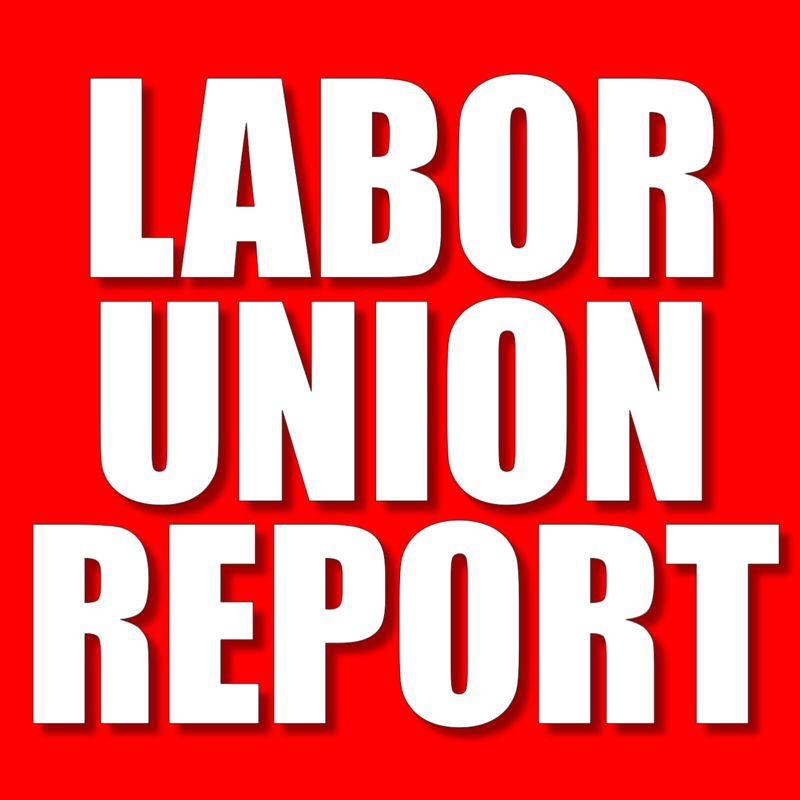 While EFCA was a priority with unions, who had spent millions on fighting to see it enacted from 2005 until it became clear it could not be passed after the 2010 mid-term elections, it is uncertain whether it is still high on union leaders’ agenda since the NLRB’s “ambush election rules” are now in effect. Here we go again! Clinton continues to pander to the AFL-CIO leadership wwith policies that have failed in the past and will do so in the future. It’s another living ecample of the definition of insanity – doing the same thig over against expecting differenct results. It also applies to Clinton’s continual denial she never transmitted secret informatsion from her personal server.